“The ability of Brijuni Architects to radically change the space relying on a unique resource is laudable. The central iron column, characteristic of a large number of premises of the neighborhood, and the technical floor which covers the old terrazzo tiles show that acid green that unifies the space and gives it character”. 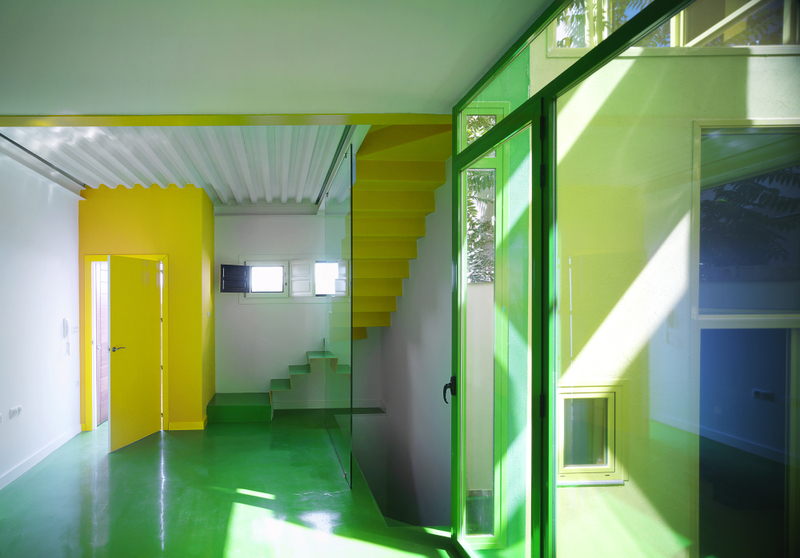 “While clients liked the ground floor, with its acid green paint and bare brickwork, they were even more impressed by the basement meeting room. This featured murals by the artist Jack Babiloni, (…), which translates as ‘knowing and earning’. ‘We admired his work before he became famous, and were so glad when he got in touch with us after we wrote a blog about his work. There are many allegories and metaphors in his paintings: they are about us and even one of employees’ cats that passed away. We used to think that the painting protected us and helped us during meetings.’ The title of the painting is ‘Brijuni is a Mental Landscape’, which aptly reflects the practice’s philosophical take on the world of architecture”.